Make Me A Mountain ! 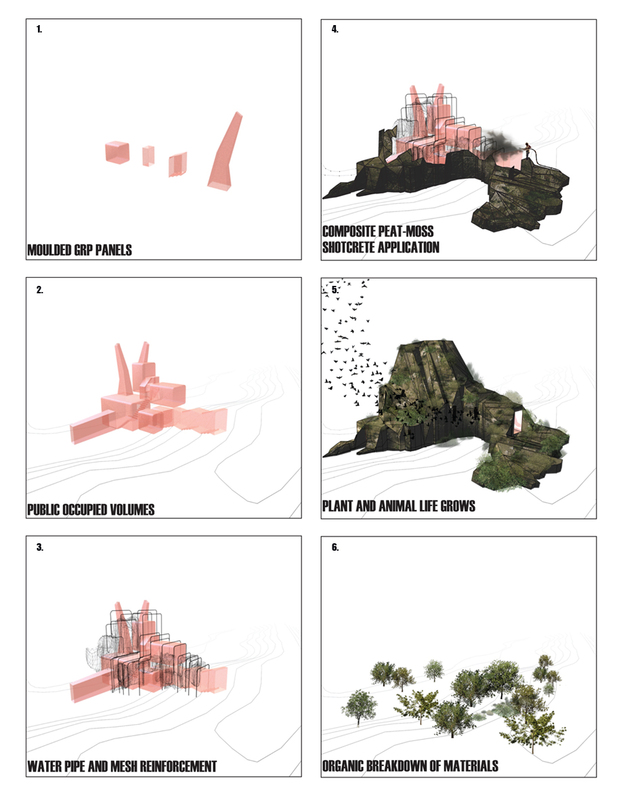 is a project developed by Liam Young from Tomorrow Thoughts Today (see former post) for the Natural System D3 Competition (the winners of this competition Lorene Faure and Kenny Tsui should be published soon on boiteaoutils). 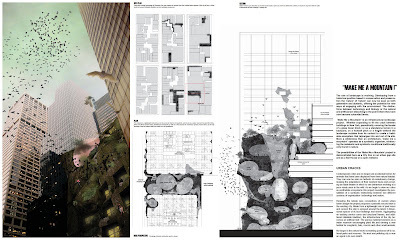 Make Me A Mountain proposes to uses New York City's urban cracks to insert a folded zoo trying to expand vertically on existing buildings' facades. 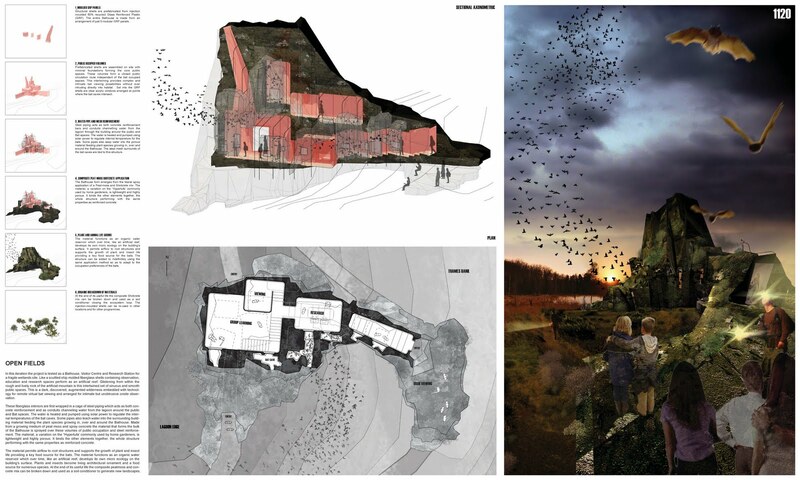 The specificity of animals (bats) is bringing wildness in the city in a non-naive trendy sustainability but rather in a more interesting renouncement to a certain degree of control. The zoo is no longer a animal exhibitionist cage but rather an animal dwelling within the city. Structural shells are prefabricated from injection moulded 80% recycled Glass Reinforced Plastic (GRP). The entire Bathouse is made from an arrangement of just 5 modular GRP panels. intruding directly into habitat. Set into the GRP shells are clear acrylic windows arranged at points where the bat caves intersect. Steel piping acts as both concrete reinforcement bars and conduits channelling water from the lagoon through the building around the public and Bat spaces. The water is heated and pumped using solar power to regulate internal temperature for the bats. Some pipes also seep water into the porous material feeding plant species growing in, over and around the Bathouse. The steel mesh surrounds of the bat caves are tied to this structure. The Bathouse form emerges from the liberal spray application of a Peat-moss and Shotcrete mix. The material, a variation on the “Hypertufa’ commonly used by home gardeners, is lightweight and highly porous. It binds the other elements together, the whole structure performing with the same properties as reinforced concrete. supports the growth of plant and insect life providing a key food source for the bats. The structure can be added to indefinitely using the same application method so as to adapt to the occupation preferences of the bats. At the end of its useful life the composite Shotcrete mix can be broken down and used as a soil conditioner closing the ecosystem loop. The injection-moulded shells can be re-used in other locations and for other programmes. “Make Me A Mountain!” By Liam Young of Tomorrows Thoughts Today. Project team: Andrew D’Occhio and James Pierre Du-Plessis. Diseases that cause hormonel imbalances and improper habitat temperatures also increase the risk of MBD. are some of the most common foods that contain goitrogens. Impaction in iguanas occurs when the intestine becomes blocked with indigestible material.